Sedona has many areas to pick from as far as beautiful homes and views go, but the Chapel Area of Sedona is one of the best—full of history. 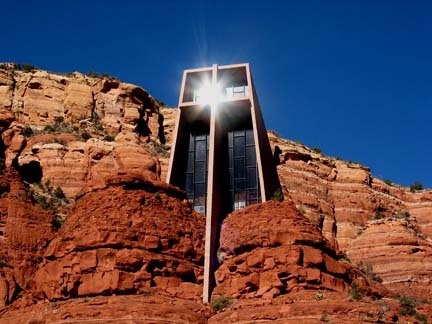 Tucked off of Highway 179, half way in-between Sedona and the Village of the Oak Creek is The Chapel of the Holy Cross. A world famous Catholic chapel, it is built into the hillside of Sedona’s red rocks. Many photographs of this chapel can be found on the internet and hundreds more are taken each year by tourists and locals alike. The Chapel construction was completed in April of 1956 and was designed by Marguerite Bruswig Staude. Sedona is also known for its hiking and day trails, and the Chapel area is one of the best places to start. One of the better known trail heads would be Broken Arrow, which inspired the title of the 1950 movie starring James Stewart. The homes in this area of Sedona are modestly priced and lend easy access to Sedona and VOC. But if you’re looking for a more modern home, or something in the higher price range, almost directly across Hwy. 179 is the Back ‘O Beyond sub-division. Developed in the ‘90’s, this gated community offers lots and homes with one or more acre of land. Plus all of the homes have excellent views!